In true Jikoni style, this is an ingenious mash up of cuisines: quail’s egg encased in prawn meat and rolled in spicy prawn cracker and panko breadcrumbs. Served with banana ketchup for dunking and a side of pickled cucumber. For those who feel the yolk maketh the scotch egg: Bill and Harry of Wolff-Evans have nailed the perfect level of ooziness. Hand-rolled in Rendlesham, Suffolk, using pork shoulder from nearby Wicks Manor Farm, these are Sourced Market stalwarts. 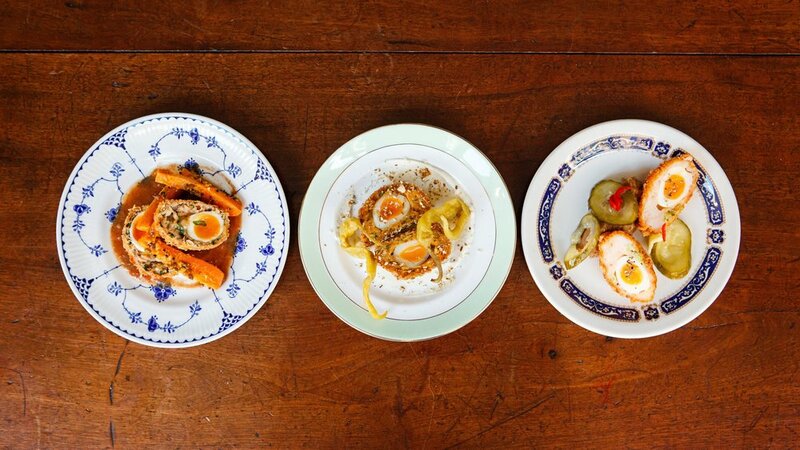 Much like everything else at The Ginger Pig, the scotch egg is traditional, but amped up in several ways. First, it’s huge. Second, the quality of the sausage meat is second to none: free-range, heritage breed and meltingly rich. If you didn’t know this was a scotch egg, you’d think two frightened hedgehogs had rolled onto your plate at The Wigmore. These tangled crunchy nests in fact hide lightly poached eggs, and come perched atop a bed of spiced dahl relish, a drizzling of yoghurt and sprinkling of coriander.